I feel like Alice. I've chased the rabbit, the dream of being a published author, and I have in turns grown too big and then too small. I have made the mistake of thinking that by virtue of being published, I am validated as a person. Personal validation is an inside job, one that I'm getting better at, but at times I'm found in need of remedial help. So, re: publishing . . . Shall I burst into tears? 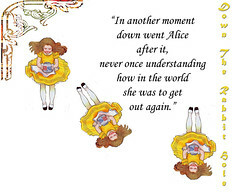 Or can I access that most-zen aspect of Alice, when she says "Curioser and curioser," an observer as well as a participant, but with ego in check? People ask if there will be a book tour. No. That's just the state of publishing today. My friend Rebecca didn't get sent on a tour until after she won the Newbery award for When You Reach Me. My friend Dave, one of the smartest guys I know, has a lot of suggestions and tough questions about sales and marketing, and reaching independent bookstores. With publishers and their publicists so befuddled these days, its as though authors are interlopers at a tea party held by the Mad Hatter and the March Hare. And I really don't know how to get Edges onto the map of all of those wonderful independent stores across the country. How to be more proactive? I'll have to create my own tour. To NYC I can say: I'll be all over you, I'll bring it, and you won't be disappointed. I will also be in Washington DC the weekend of December 18th, Orlando, Florida in February for President's Week, and possibly in the Bay Area next Spring. Maybe I'll find out more in the next couple of weeks about an online and an overall marketing plan. If I don't, or if it makes me feel more confused and I do float away on my puddle of tears, I'll just have to remember it is part of my journey and will take me to another opening, another door, and remain curioser and curioser. I'm sure word of mouth will do wonders, Lena! And you'll get that tour eventually. Several authors I know of do guest blogs or interviews at their friends' blogsites. And being willing to do Skype visit for book clubs, libraries, schools, etc is great. Also, creating a FB page for the book so people can become a fan of EDGES and suggest it to their friends. The old saying that if you tell 100 people, and they tell 100 people, etc can go quickly in the cyberworld. All the best! Lena, I understand! This is what all of us fear, and most writers' experience. I actually had an official book tour when my novel came out back in the ancient days of 2006. Though I was flattered and excited, when all was said and done, I couldn't help feeling that the money my publisher spent to send me out could've been better wasted on a well-targeted online campaign. Your vibes everywhere are much appreciated, Sandy! And Jennifer, I DID it! Thanks to you ALL, EDGES has it's own FB page, but I have to admit, it wasn't so easy! Although now I see what I did wrong at first. Ah, technology. So humbling! And Judith! Talk about grassroots campaigning. Awesome! Ack! Being published doesn't validate you as a person? I will rally my little corner of the world behind you (even though it's not too far from your corner). BTW, thank you for your kind comment on my blog a few weeks ago. Don't know if you saw my follow-up, but I am a hug ML'E fan, too, and love the Upper West Side mostly b/c of her. I love reading your blog and look forward to reading EDGES! How frustrating that the work is far from over once you're published. You are an inspiration, though. Don't lose heart! Thank you so much Alison! Go Team!